The city of Campbell River, B.C. has set up a Forestry Task Force—chaired by a forest industry veteran—to revive the forest industry in the Vancouver Island community. COFI convention—Where to from here for lumber markets? With softening lumber markets in China, and a still slowly recovering U.S. housing market, the industry has definitely got some challenges ahead of it, all of which will be discussed at the Council of Forest Industries annual convention and trade show, coming up in Kelowna, B.C. April 6-8. Ontario’s White River Forest Products sawmill is intent on being one of Canada’s most efficient sawmills, and that effort recently received a $15 million capital investment that will significantly boost production. B.C.’s Tolko Industries was the first operation in North America to use a winch-assist forestry machine—the ClimbMAX steep slope harvester from New Zealand—and their experience so far has been positive. Island Pacific Logging has been using the steep slope Remote Operated Bulldozer (ROB) winch assist system—developed in New Zealand—on Vancouver Island since last summer, and it’s working so well that the company has agreed to be the North American distributor for the system. Producing everything from solid wood products to shavings, the Lewis Mouldings and Wood Specialties mill operation in Nova Scotia is known for its high wood utilization. Groupe Savoie tried out a number of log loading machines for the millyard at their sawmill in Quentin, New Brunswick, and decided on a Sennebogen 830 M-T, a log handler that is able to handle the cold—and wet weather—that hits the region. Whatever happens in the forest industry in 2016, it sure as heck isn’t going to be boring, says Jim Stirling. Alberta has reached the final stage in its quest to provide comprehensive public data on the quality, quantity and availability of forest and other biomass resources. Among other things, this will help potential investors in the bioeconomy make informed decisions about their ability to access these raw materials. The province is preparing to launch its online and state-of-the-art Bio-Resource Information Management System (BRIMS) in early 2017, developed with funding provided by Alberta Innovates Bio Solutions (AI Bio). The overall vision of BRIMS is to create a world-class, publicly available, data and information management system where buyers and sellers collaborate and develop opportunities, using online tools to support investment, guide policy development, and foster further analysis to advance the bioeconomy in Alberta. The decision was made to start with an inventory of Alberta biomass due to the demand for the information, and immediate opportunities for new bioindustrial sector and business development. BRIMS has made it possible to map the locations and different types of biomass available across the province. “The data will be updated regularly to ensure it is valid and remains current,” says Carol Bettac, AI Bio’s executive director of emerging opportunities and strategic alliances. AI Bio partnered with Silvacom—a company that provides geospatial software and consulting services—to research other systems, test the concepts, integrate and align data sources, and build the online platform on which BRIMS will operate. The complex project has required a multi-phase approach. Phase 3 of BRIMS development, currently underway, is refining the pools of data. These include: forestry harvest and processing residue; crop residue; livestock manure and processing waste; organic and other useable biomass received at landfills, and potential resources from other biomass feedstocks and sources. To improve the quality of forest biomass data, Silvacom partnered with seven Alberta forest companies to develop a comprehensive automated land inventory program called CALI, using some of today’s best high-resolution imagery and data-processing technology. It provides a more refined analysis of wood fibre attributes in a particular area, down to the individual tree level. In its final form, BRIMS will represent much more than a clearinghouse for information about the quantity and location of biomass resources in the province. It will be unique in that it will give the online user the ability to break down and calculate the amount of useable biomass constituents from a biomass source. For example, it will have the ability to break down the availability of lignin, cellulose and hemicellulose from a wood resource. This knowledge is critical for individuals interested in the production of biofuels such as cellulosic ethanol. AI Bio made the development of BRIMS a priority as identified in its Ecosystem Services Roadmap in 2012. The roadmap’s goal is to bring Alberta to the forefront of innovation by using an “ecosystem services market approach.” with environmental excellence. It identified the need for a data and information management system like BRIMS as an important step forward, Bettac says. The term “ecosystem services” is defined as “benefits society enjoys from a range of resources and processes supplied by nature.” This concept has been a guiding principle behind BRIMS’ development. Biomass is considered an ecosystem service. Other examples include clean water, food and wildlife habitat. A market approach puts an economic value (dollar amount) on natural resources and processes. This helps industry and government understand the relative value and benefits of these “ecosystem services,” and gauge how they will be affected by human activities. and development in the future. The Canadian Wood Fibre Centre (CWFC) plans to evaluate over 40 years of intensive forest management practices applied in the Canadian commercial forest to assess how those practices have impacted the forest resource and a sustainable timber supply. This is to ensure that future forest management practices maintain healthy forests, a sustainable wood supply, and a diverse wood basket to meet the needs of Canada’s future forest industry. Canadian forest management has evolved through several stages over the past four decades. It started with little or natural reforestation taking place, to a recognition in the 1970s of the liability this represented and the adoption of government-mandated, managed forest management practices, including reforestation, aimed at sustainability. Forest harvesting ramped up significantly in the 1980s to about 850,000 hectares harvested per year with companies developing more diverse wood product lines. This resulted in greater regulation due to concerns about replenishing and sustaining forest resources, with advances in such silviculture techniques as tree planting, site preparation, and scarification for natural regeneration or seeding. 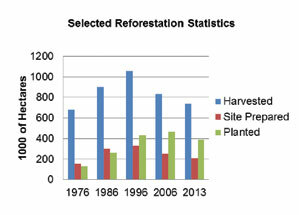 In the early 1990s, governments launched a massive backlog reforestation program to accelerate reforestation to sustain, advance, and enhance forest stewardship and sustainability, based on the escalating harvest of Canadian forest resources, which had reached over one million hectares annually by the early 2000’s. “As forest management evolved, more intensive and advanced forest management activities started to take place,” says Derek Sidders, CWFC Regional Coordinator and Program Manager at the Northern Forestry Centre in Edmonton. “A change has been imposed on the forest in terms of species mix, densities, growth, productivity and vigor. As part of CWFC’s core research program built around sustainable forest resource production practices and fibre characterization, it will evaluate whether the Canadian wood fibre resource is sustainable based on management practices that have evolved and been applied over the past 40 years, is the resource at risk due to a changing climate, and has enough follow up been done on these intensively managed forests to sustain, advance and enhance the future forest, while at the same time, maintaining Canada’s international leadership and competitiveness on its forest management, product development, and ecosystem management practices. CWFC will ask important questions such as: is there is a need for greater, mid-term stand intervention in some cases to maintain healthy forests, to enhance forest productivity in some instances, and to produce wood fibre with the types of attributes needed by the future forest industry? 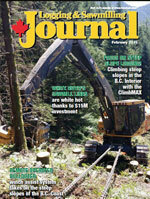 “We’re focusing heavily now on wood fibre characterization, which is quantifying and classifying the forest across Canada as it exists today, and production systems that will deliver forest fibre with known characteristics that can assist with transforming the industry while sustaining the forest resource,” says Sidders. For more information about this CWFC initiative, contact Derek Sidders at Derek.Sidders@canada.ca.